The release of QLab 4 saw the addition of lighting control to the already pretty comprehensive audio, visual and show control toolset. This time last year, it was early days in the public release and since then the new tools have started to emerge into their intended market. Today we won’t go back over the current toolset or UI but instead consider the market itself. The QLab course over at Learn@OnStageLighting is a bit different to our usual stage lighting content and there is often a demographic gap between your standard ‘lampie’ and those using QLab. With the planned development of the QLab lighting toolset, this has the potential to converge and already I’m seeing techs with a lighting control background branching out into audio and video control and learning QLab skills. Solo artist/performer with tech skills. This is a significant market for Figure 53, one where small performances are developed with multimedia elements alongside live performance. These are often run from a central system and often triggered by the performer themselves. Who knows very little about lighting control but knows QLab. This person is your typical sound / video playback person. They hung a fresnel a while back when someone asked them to but it was upside down, which the lampie was kind enough not to mention. They are maybe a whiz with a Digico or Avid, but lighting is a ‘black art’ and they aren’t sure if they really want to start getting into at this late stage in their career. This person may be a big-deal Sound Designer, in which case they are even less interested in lighting control. Lighting person that doesn’t know QLab. This ‘black-art-ist’ tries to avoid getting into stuff that looks like it might be a soundie gig. On the last tour, they noticed that some of the big bass speakery box things were facing the wrong way but didn’t like to mention it. Maybe the sound comes out of the wheels end on that model. Lighting person with wide lighting control experience and has big needs/expectations. This person loves nothing better than to program the Grand Whole 4 software to command an impressive array of nodding buckets and be master of all they survey. Instead of socialising, they prefer to hook up the visualiser and knock out a few looks on a Saturday night. They can see a need to get into video but anything that looks like sound kit can take a hike. All-round tech that does a bit of everything. And produces shows that needs everything! This person knows a bit about absolutely everything and is indispensable to every poor-assed theatre company and circus act in a 50 mile radius. Their value is huge and their remuneration usually pitiful. They make magic happen using their own Mac and bits of hardware scraped together to cover the fact that, again, the producer has champagne ideas on Tizer money. Yes, there are probably bigger and better tools for each and every job but QLab does enough of everything to a fair level. Maybe one day they’ll be able to get a lighting desk in, but today is not that day. Between huge, complex shows and Mrs. TiggyWinkle’s Theatre Company, Figure 53’s QLab has a wide market and a toolset to match. Being known for audio (and latterly, video) tools obviously gives QLab a head start with all those technicians and designers in those areas of the sector. Thought of by many as theatre software, QLab is actually now the go-to for other types of event and performance including corporate shows and site-specific installations. Will lighting ever really be a QLab thing? Yesterday, Chris Ashworth from Figure 53 confirmed that they definitely want QLab to become a ‘lighting thing’. QLab is unarguably a sound and video thing. It’s also a show control thing. It has lighting control tools. Will it ever really be an actual lighting thing? There are a few factors that would contribute to this. In sound and video, techs view QLab as a thing even if there are other specialist tools available to them. In lighting, most lighting people don’t yet view QLab as a thing in the same way. They might not like a particular lighting desk, but they acknowledge it as a part of their world. QLab, not so much. To them, they often don’t know QLab particularly well and all they see is the first draft toolset and not what they are used to. Even the bottom end of the lighting system that they now control is ever more complex. The sound/video people are happy enough to leave lighting alone. They are broadly happy with the high level of support and feature implementation they are getting from Figure 53. They just need to feel like they still matter when it comes to development. The All-round tech sees the value in being able to do a lot with very little and is willing to deal with the trade-off. When they do get a chance to bring that ETC Ion in, they’ll be OSC-ing up the wazoo and gleefully getting back to a ‘proper’ lighting control. But perhaps as the lighting toolset grows, they’ll find that option less attractive. This requires a push in both conceptual and UI development from Figure 53 to bring the trademark QLab simplicity to complex lighting control. It needs significant input from people that understand complex lighting control at a level beyond the theatre-stack-Go-button-ETC-is-lighting people and fresh eyes that avoid any toolset or UI being just a fancy-paste from lighting control concepts that were worked up in the 20th century. Let’s just consider for a moment that the UX for a majority of lighting control tasks was actually developed before mouse/screen interaction. Even today, lighting control paradigms of the Strand Galaxy and it’s forefathers are still lurking beneath shiny touchscreens and keypads. All-round techs, drama groups, performers and multi-skilled freelancers in all genres of performance are dipping their toes in the QLab water already, many are already swimming. I’m also seeing more lighting techs taking an interest in the QLab overall cueing and control toolset, irrespective of the lighting functionality. I’m personally excited to see developments in the lighting toolset because I know that it’s likely to be something I’d enjoy. As you are still here, I’d be willing bet you are one of those people that is always looking to learn new things and experiment with different stuff. I know because I’m exactly the same. I’ve been teaching QLab since version 2 was released and during that time have seen the product gain popularity and become the standard in many corners of the performance industry. A young person with any level of technical production training should be exposed to QLab and it’s an important skill for those in stage management as well as technicians. 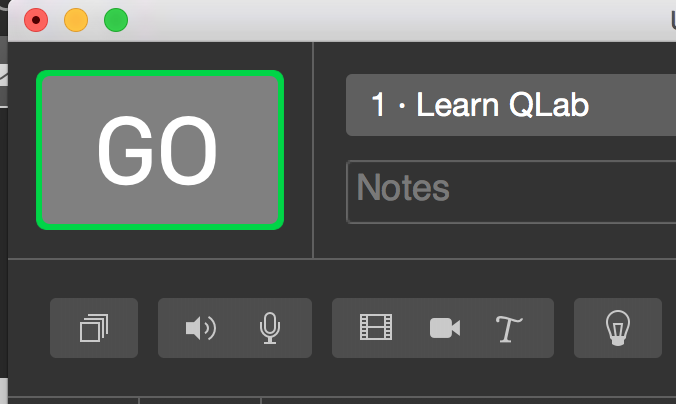 If you aren’t yet into QLab, the good news is that I still have a couple of places left on the next QLab 4 online course where I take learner through to the completion of a project – a working show file of some complexity. This which would get you programming and running for own shows in 2018. As far as I know, this is the only QLab course of it’s kind that is available to anyone in the world and is delivered through the flexible medium of a custom Virtual Learning Environment. You’ll need to be quick though, as we start on 24th November 2017 for the last time this year. I’d love to have you with us on the ‘other side’ and we can get started. Just click on the link and go through to Paypal to secure your place on the QLab course. Rob- Any chance of getting that QLab training? Sure. I do various options, best to email me to discuss.